Wonton Cones are just a cute party addition to any table. They look fun, they are easy to use and they can be made up in advance. I like that. I made these three days before I used them and stored them in an air tight bag. They were still fresh and crispy as the day I made them. I have filled mine with an Oriental Salad Mixture (recipe will be shared on Sunday for Sunday Supper and Super Bowl Sunday). 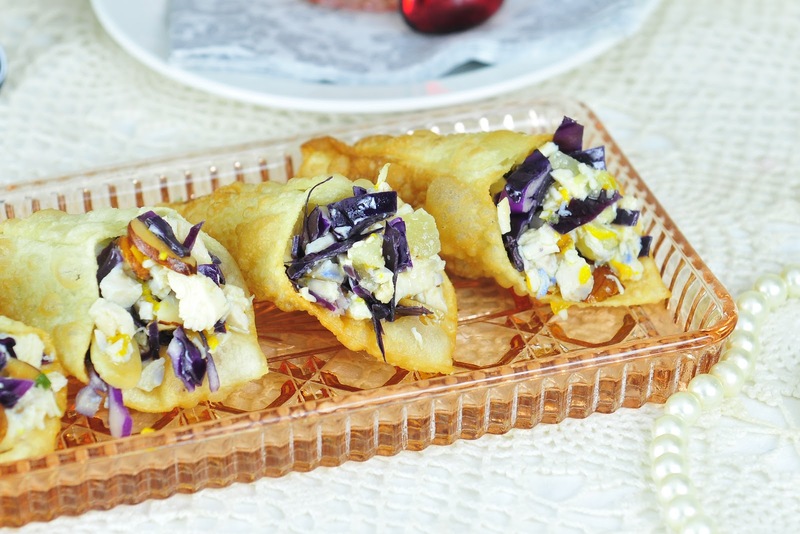 These Wonton Cones are easy to make. 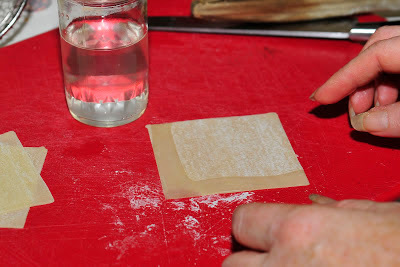 The tricky part is making sure the oil is not too hot and that you have the right tool to work with. What is the right tool? Well, I have seen a carrot used, a medal cylinder and a piping nozzle used for decorating cakes. Hmmmmm. Well, I decided to use the end of my wooden spoon. 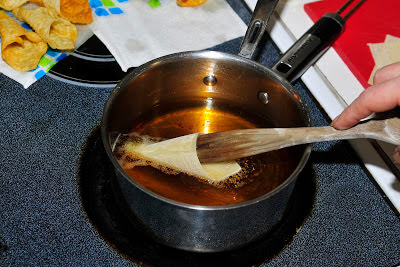 It was an easy decision--I already had tons of wooden spoons, they would not get too hot in th oil and burn me and it made the cones exactly the same each time. Perfect! I have put together a step-by-step pictorial so that you can see how they are made. 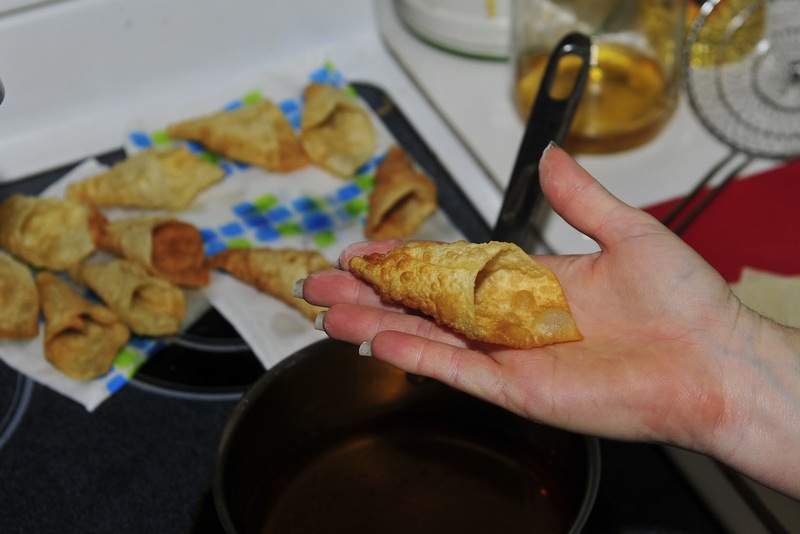 The list of ingredients needed to make these cones is easy: oil, small amount of water and wonton wrappers. 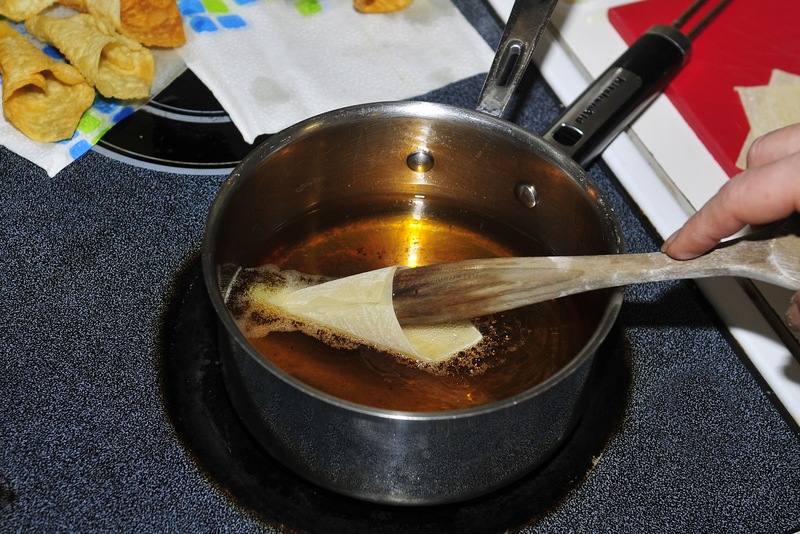 Make sure the oil is 3 inches deep and the temperature is around 350 degrees (use a thermometer to insure the temperature is correct). If the oil gets too hot, the cones will get very dark. Please be very careful. You will be working with hot, hot oil. The spoon is used as a tool to help you mold and retrieve the cones from the oil, you may be tempted to use your fingers here and there--use caution. 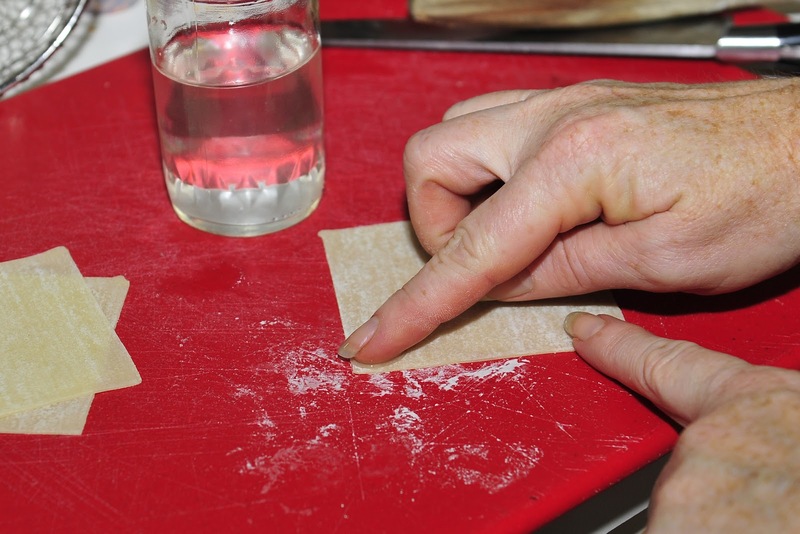 The cooking time for each wonton is quick. Maybe 30-45 seconds depending on how hot your oil is and how dark you want them to be. Once you make a few of them, you will find the timing and rythmn of making the cones and it will move along quickly. If you have a helper, some one who can make them while you cook them, that would be even better. I did not have that option. Place napkins near by so that you can let them cool before transfering them to an airtight container or bag. The pictures below all contain wrappers that are not gluten free. 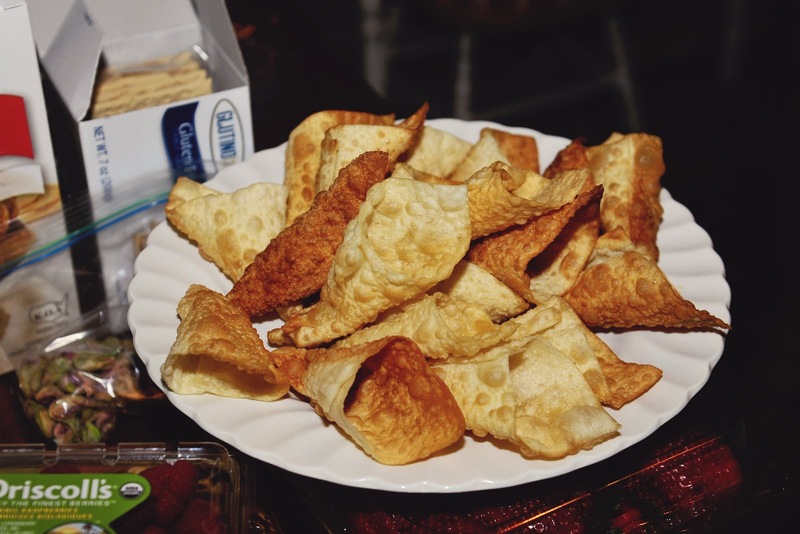 I have not made the cones using a gluten free recipe. If you would like to try a gluten free version, this seems to be the best recipe out there from, Gluten Free on a Shoestring. 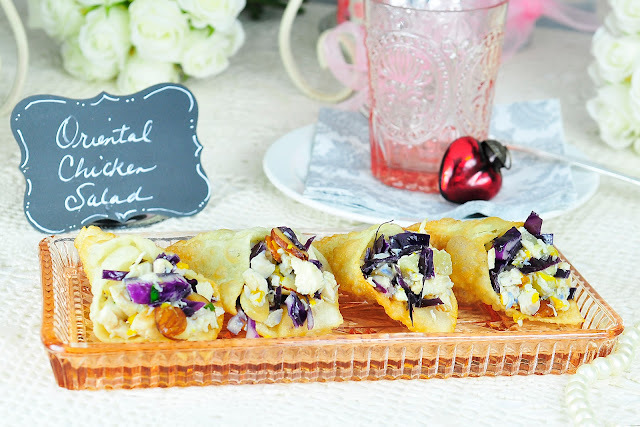 You will find the recipe here. 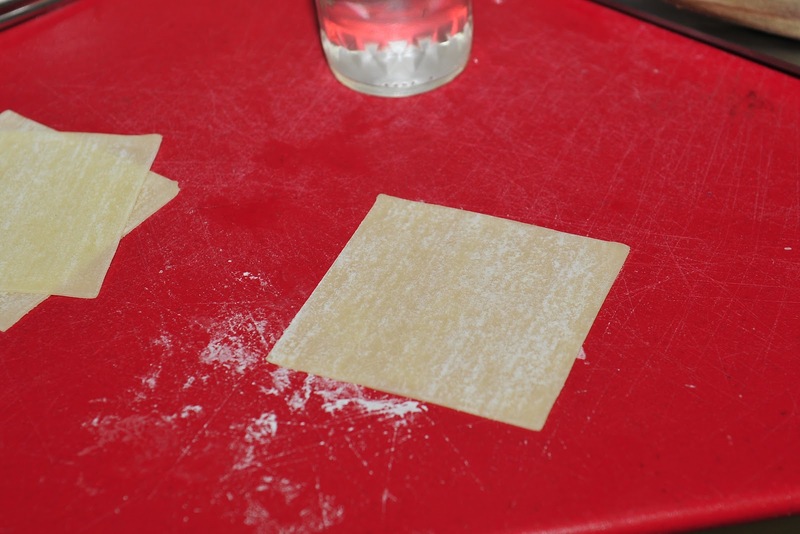 Place each wonton wrapper on your work surface. The wonton's are more pliable if they are at room temperature. Let them set out on the counter an hour before you make the cones. Dip your finger in the water and start in the left corner. While your finger is wet with water, drag it up one side and return to the corner. Drag your wet finger down the other side. Two sides are now wet with water. Fold the corner so that the tip makes a trianle ontop of the wonton wrapper. 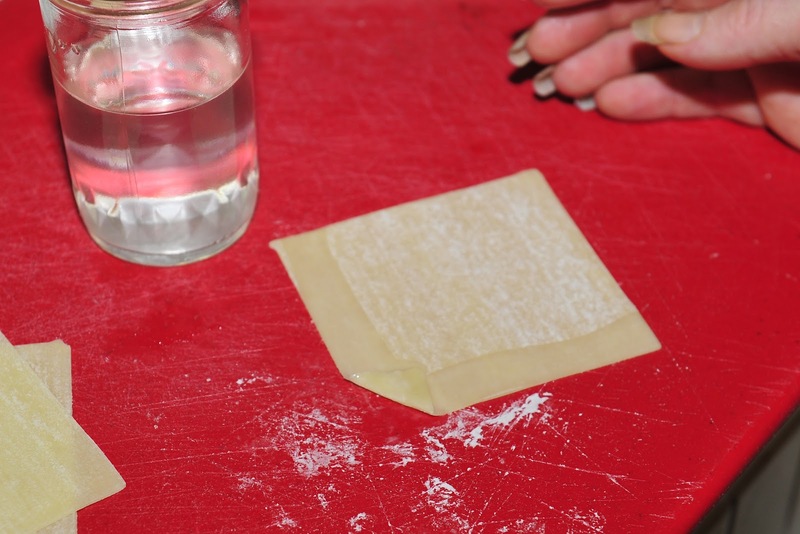 Take the one side of the wonton wrapper and fold it over the meet the other side (you want the two wet sides to overlap and seal the cone). This is what you should have when the steps above have been followed. 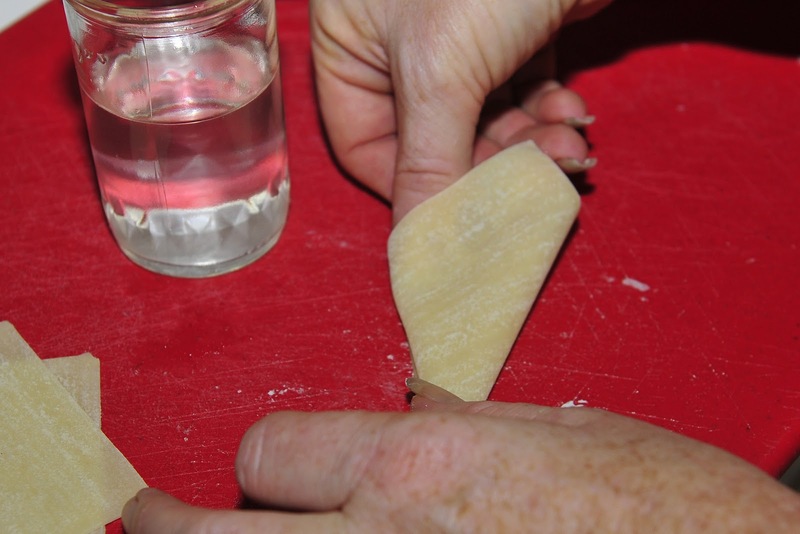 Using the end of a wooden spoon, place it inside the wonton wrapper. Make sure your oil is hot. 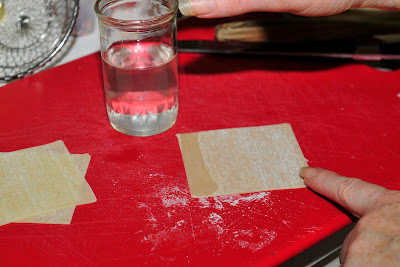 Add the wonton to the oil, pushing it under the oil and rotating the spoon in a circle in your hand. You are twirling the handle so that the oil is able to get to all of the sides of the cone. The cone will start to bubble and you can see that it is turning a light brown. At some point the cone may fall off of the spoon. This is okay. 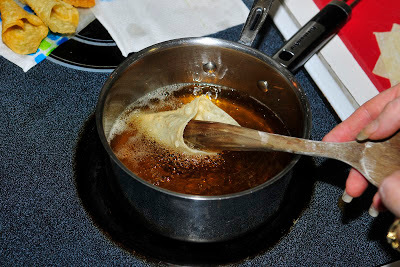 Push it under the oil to cook the inside. 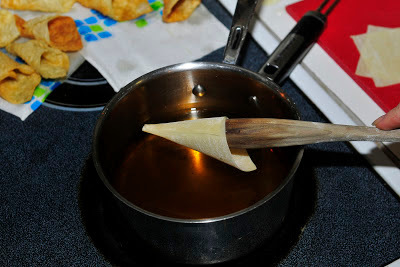 Take the spoon handle and slip it inside the cone shape and pull it out of the hot oil. 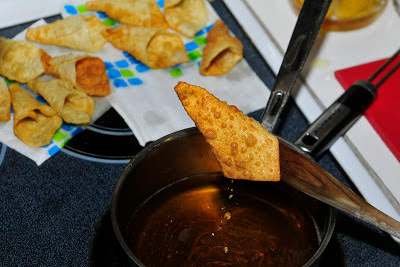 You can also use a wire mesh frying spatula to retrieve the cone. 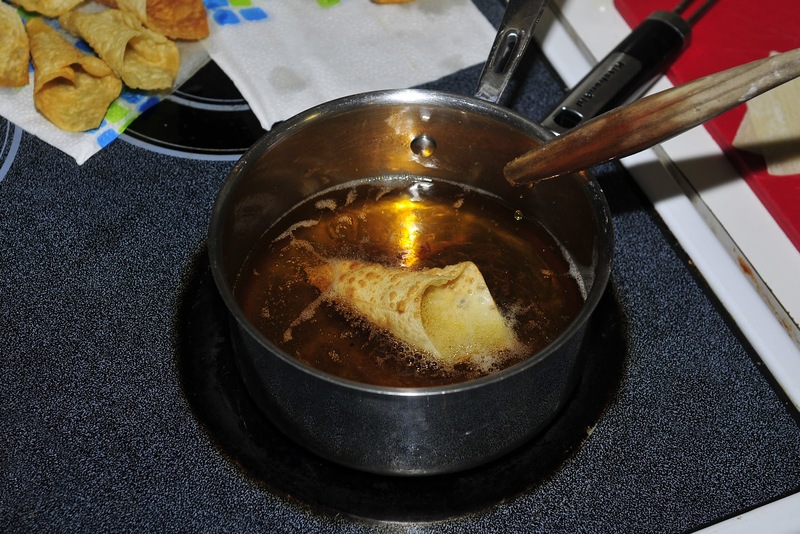 Tip the cone slightly so that the excess oil can drain out. 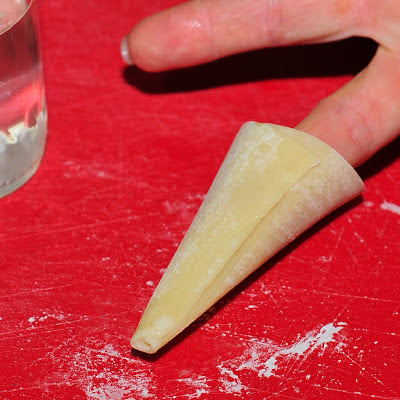 Let the cone cool for a few minutes and then you can handle them. They can be filled right away or saved for a later date. You can see some of the cones are darker than the others. As long as they don't taste burnt, they are still good. 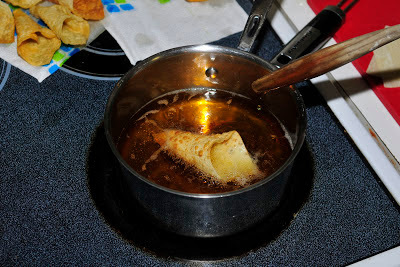 I found that the cones will continue to darken and cook once they are removed from the hot oil so keep this in mind.